All the stuff in my craft bin...and all the junk in my head. My latest obsession is knitting podcasts. Who knew so many knitters were making podcasts?! So far I've spent most of my time listening to the Knitmore Girls and that is the best way for a knitter to get through a work day. Seriously if you haven't listened to them then you are in for a treat. They have several segments of which On the needles, Review and When knitting attacks are my favorites. They have so much knowledge to share and they are so charming that they keep me coming back for more. You can look forward to more podcast reviews from me in the future. Happy listening! 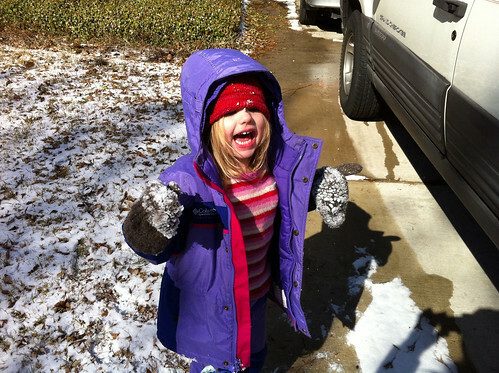 And here is a little picture of my daughter enjoying our rare central Texas snow. I love knitting but when I started it wasn't very relaxing. Also I am a working mom of young children and as you probably know this brings plenty of challenges. I've been referred to a physical therapist twice in the past 3 years. Once to solve a frozen shoulder and another time to address neck tension so bad that it caused long-term headaches behind my eyes. Unfortunately my tense knitting was not helping matters; so I had to re-learn how to knit in a relaxed manner. Here are some of my techniques and I hope they help you. 5. Read through your pattern before you start knitting and look for potential gotchas. Highlight increases and decreases, repeats and circle the numbers for your size. 6. Pretend that you are holding something fragile alongside your needles. 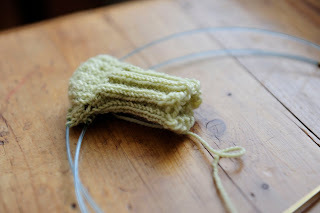 I like to pretend I'm holding a bird egg along with my needles; this helps to loosen my grip. 9. Relax your eyes; if you are working stockinette or some other easy stitch let your vision get a little soft. Let me know what you do to stay relaxed while you knit. I'd love to hear your comments. 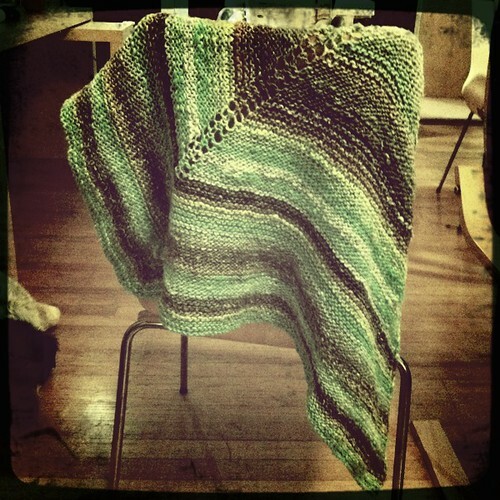 This is a very simple triangular shawl I knit from 3 balls of Noro Chirimen in a green colorway. The colors remind me of our summer trip to the beach so I named it after the beach-town my family lives in. I've never had a shawl before and I wasn't sure how often I would use it. I've worn it twice in two weeks. So what's unraveled here lately? Me for one. And my baby's new sock for another. First here's why I'm unraveled. I knew that having a toddler and an infant would be tough. I knew this because I'd read a book and heard a few stories from other parents, that makes me an expert right? But wow, it did not adequately prepare me for this, one of the greatest challenges of my parenthood so far (I know, it's only been 2 1/2 years sigh). My infant is now 8 weeks old and most of it has been a blur. But one thing that stands out is how my sweet 2 and 1/2 year old turned into a bitter teenager in such a short time. It seems like nothing my husband and I do is right; she yells at us and tells us to "let me be" or "just go away". Where did she learn this language anyway? Her new nickname is the "obstructionist" because apparently her resolution for 2010 was to impede whatever it is that Chris and I are trying to do, walk through the hall, open the bathroom door, and it goes on and on. So I've been thinking of how I could explain the juggling act to my girlfriends. And then life provided a good example for me. So I'm changing Violet's diaper on the changing table. And Olivia insists on getting into the room to stand on her stool and watch. As I'm cleaning up one of the poopiest diapers Vi has created in her new short life, I mean there was poop all the way to the poor girls chest with an impressive amount pooled up in her bellybutton, Liv has put her hands on every part of Vi that I'm trying to clean or dress. I can't pick up Vi to remove her poopy onesie without prying Liv's hands off of her. Then I've got to remove Liv's grip from Vi's arm just so I could put on her clean shirt. It's amazing that neither Liv nor I ended up splattered in poo. And the walls were still clean too! Now that's some juggling. Now for the sock's unraveling. Like I mentioned in my previous post I'm adapting a pattern for an adult-sized sock to fit an infant. So I guessed at the number of stitches to cast on. I thought well if I cast on 60 for me surely Vi's foot couldn't require more than half of that! So I'm knitting happily along, and watching the Oscars (hello George!) when I get far enough with the foot portion to want to see the cute little sock on my chubby girl. I had tried the leg section on her a day ago, before I worked the heel and thought that it was just big enough. Well I can't quite figure out what changed but I was wrong! I couldn't even get it over her ankle tonight. I am a stubborn Texan and so was tempted to "make it work" and then realized that having a screaming baby was not what I wanted to sacrifice in order to see some knitting success. So I made my husband admire the sock, I even made him touch it, he rolled his eyes and muttered something about me being a little scary, before I ripped it all out. I'm pretty sure he thought I was losing it but I just haven't had a lot of knitting success lately and had it in my mind that this project would be a slam-dunk. And now my cold has blossomed into something finer and the paranoid side of me thinks I must have pneumonia and pink eye. Oh I'm not sure when I'll have the fortitude to start the sock again, is it wise to knit with an itchy, swollen eye? A few nights ago I realized that my baby has only one pair of socks that fit her. So I grabbed some sock yarn from my stash and started looking for a baby sock pattern on Ravelry. There were a lot but I didn't have time to search for one written for two circular needles. Since I was anxious to start knitting I decided to use the pattern I have and adapt it to fit an infant. I really like the Adam's Rib His and Hers Socks pattern. It's the pattern I used for the first pair of socks I knit and it is very easy to understand. Also it is written for two circular needles which suits me because I am all thumbs with double pointed needles. 2009 was a bitter sweet year and I thank my lucky stars that it's over. In January I found out my company was essentially up for sale and my job stability was highly questionable. Hello stress! In March I learned that my sister needed surgery. In April I lost one of my grandmothers. In April I hit the extreme fatigue and sickness that comes with the first trimester of pregnancy. In July and August I spent every spare moment looking for a new job (while preggers). In August 95% of my friends and co-workers were let go. In September my daughter started preschool and therefore was sick almost every day for the rest of the year. In October my daughter got the swine flu and I had to leave the house for 5 days to avoid getting the flu while pregnant. We'd never been apart before and this was extremely difficult for us. Also in October I started having regular contractions and was put on bed rest. In November my husband had major surgery on his nose and sinuses. Goodbye bed rest. In December I was 9 months pregnant and quite the grinch. My sister is well and the results of the surgery were all good. The rest of my family is now healthy and my husband can breathe better than he has in probably 10 years. I kept my job although working in a mostly empty building is quite depressing and humbling. And of course expecting our second child brought great joy. And now for knitting! I have been doing quite a bit considering the year I've had. But unfortunately I've been too busy or sick to post about any of the projects. 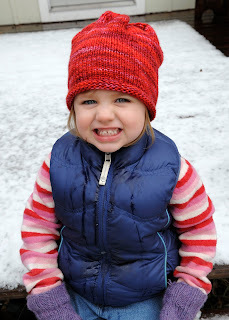 So here is a picture of my daughter Liv in my first successful project of 2010, the Felicity hat. 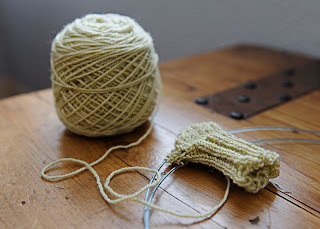 I cast on 60 stitches and did a few less increase and decrease rows to fit Liv. This is Malabrigo worsted in a striking red. Liv picked out the color herself. I'm Tracey. I'm a mom, wife and a working gal. I knit. And I make mistakes...lots of them. And I'm going to blog about them. The idea is that I will knit mistakes so you don't have to. Seriously. Feel free to learn from my stupid mistakes. 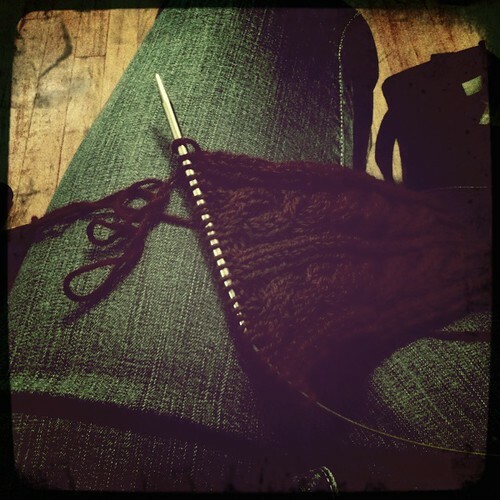 Oh, and I plan to blog about parenthood, life and crafts other than knitting.